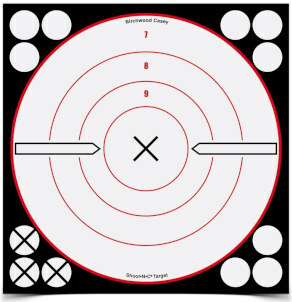 Here’s a new target that should be very useful at long range (500 yards and beyond). 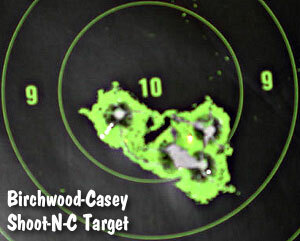 The new 12″ square Birchwood Casey white background Sight-In Target displays a black “halo” around each hit (like the yellow circle on a conventional Shoot-N-C). Larger than bullet diameter, the “halos” can be easily seen with a high-magnification scope at long range. 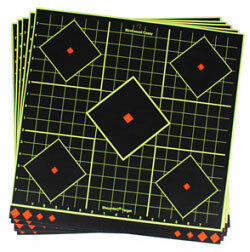 The self-adhesive target features four diamonds with contrasting red box centers. For precise aiming, you can position your cross-hairs to align with the corners of the boxes. Or, you can put a target dot sticker in the middle. 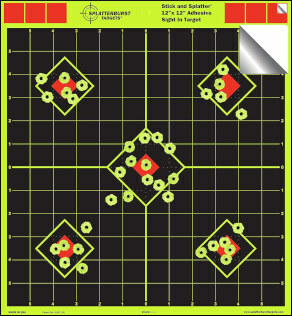 The new sight-in target has five aiming points and a 1-inch grid overlay for quick and easy sight adjustments. 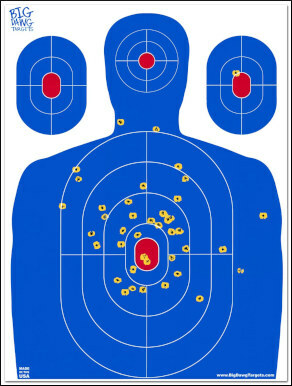 It comes with target pasters that allow shooters to cover up bullet holes and continue using the target for added value. 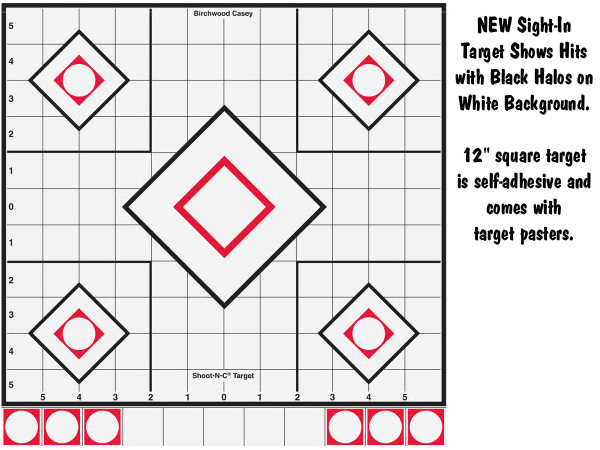 The new White/Black Shoot-N-C 12″ Sight-In Targets come in packs of five with 75 target pasters for a suggested retail price of $12.70. 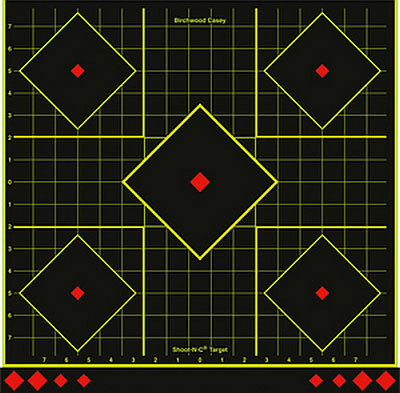 If you prefer a target that displays yellow/green “halos”, Birchwood Casey also makes a 12″ grid target with four yellow-edged diamonds. 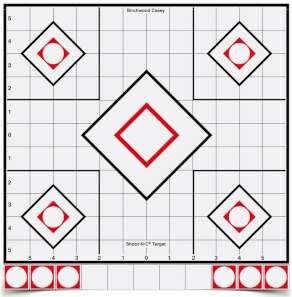 Red circles provide precise aiming points in the middle of each box. 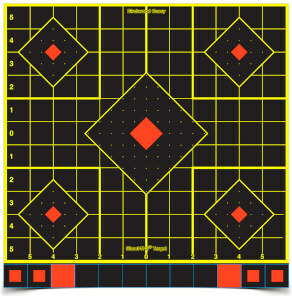 You can quickly estimate group size or dial-in your zero using the hi-viz yellow 1″ grid lines. 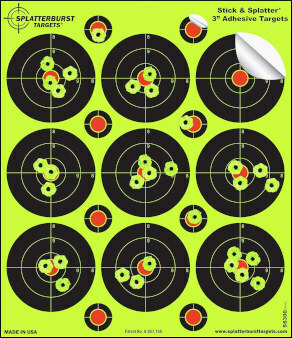 Share the post "New White Background Sight-In Target from Birchwood Casey"
Looking for training targets, competition targets, or fun targets? 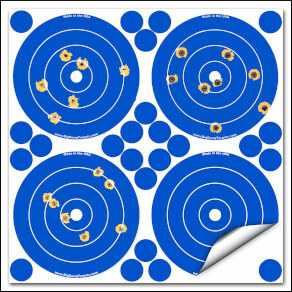 Well Creedmoor Sports has what you need for NRA smallbore and centerfire competition (including target pasters). 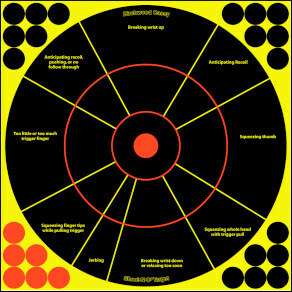 Creedmoor has the official targets for most popular NRA disciplines along with the “Target Repair Centers” (Bullseye overlays that save money compared to full-size targets). 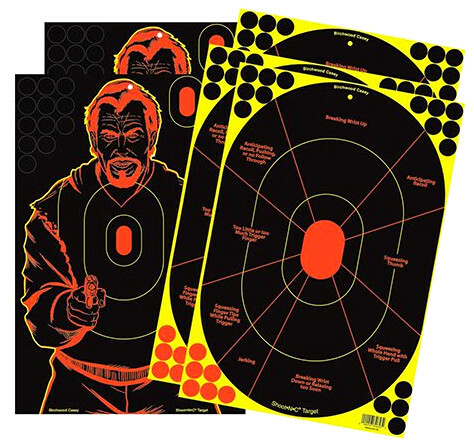 In stock now are official F-Class targets, High Power rifle targets, smallbore targets, pistol targets, and air rifle targets. 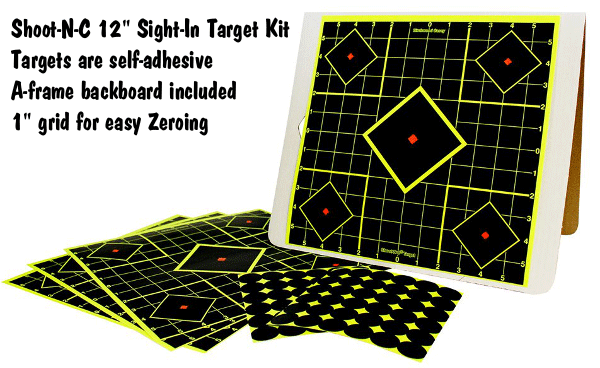 Creedmoor also now carries Birchwood Casey Shoot-N-C targets and Hi-Viz Orange Target Spots®. 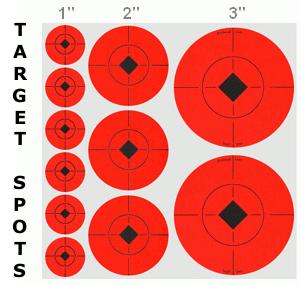 When practicing with scoped rifles, we use the 1″ Target Spots at 200 yards, and the 3″ Target Spots at 600. 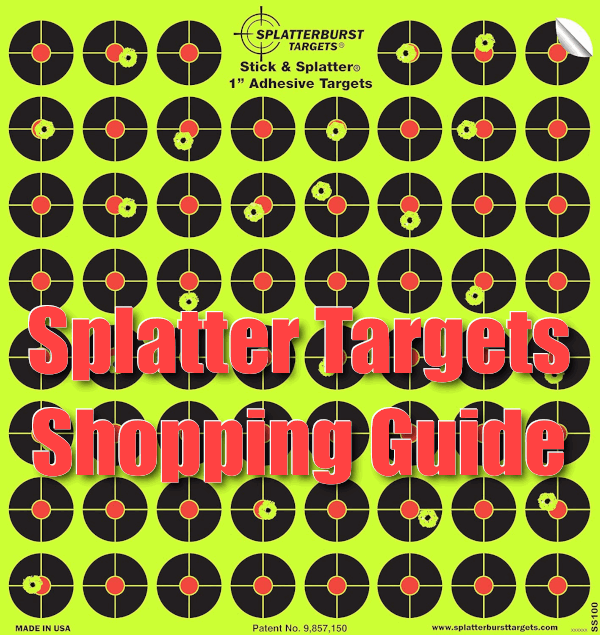 Share the post "Need Targets? Creedmoor Sports Has You Covered…"